Whew! We're still cooling off after Saturday night's concert at the Coliseum. (Do they even have air conditioning there?) Circulation manager Portia Zwicker and I went to the Idols show, sitting in the 11th row; elsewhere in the seats were executive editor Chad Anderson, subscription services manager Karla Novick and Elliott-story-writer Joan Tupponce. Richmag representing. If you're an idol-worshipper, you've probably read the T-D's flood-the-zone coverage. But you didn't hear about the 40-something woman down the aisle from me who screamed, "I'll be your slave, Elliott!" That was during "Moody's Mood For Love": "There I go, there I go, there I go-ooh." Yes, she did go there. But in the steamin' hot Coliseum, such outbursts seemed absolutely acceptable. A few thoughts: Kellie Pickler has a very small waist, emphasized by the red corset top she wore over jeans. And she and Bucky need to stay away from "Grease" tunes. The duet of "You're the One That I Want" was a little less-than-thrilling. Paris, on the other hand, got everyone up and dancing (or at least me and a few other folks on the row) with Beyonce's "Crazy In Love." That girl has true showmanship. Best female voice, in my view, belongs to Mandisa. "I'm Every Woman" as an opener was perfect. I still don't care for the boy-bandish quality of Ace, but now I understand what all the girls were swooning about. In person, he is H-O-T hot. And the leap from the risers onto the stage was impressive. So much so, he did it again in the encore. One of the best things about the show was that some of the performers got to play instruments: Lisa on piano, Bucky, Chris and Taylor on guitar. Taylor also played harmonica and in one of his more manic moments, banged a tambourine. He's clearly in the running against James Brown for hardest-working man in show business. He danced so hard that his black shirt blew up, giving us a flash of stomach. I wonder what Simon would have said. Katherine, still sounding a little scratchy from laryngitis, sang only two solo songs: "Somewhere Over the Rainbow" of course and the cherry-tree one. You know which one I'm talking about. Still beautiful (great white dress, not as tight as the ones on TV), still not terribly charismatic. But we're glad she's feeling better. Chris sang the most daring song in the show: "Whole Lotta Love" by Led Zeppelin. Read the lyrics: That's a whole lotta sexual innuendo for the preteens in the audience! Nonetheless, I had a good time dancing to it. I guess that's it. Oh. You wanted to hear more about Elliott? As we were leaving, Portia and I walked past Claudette (surrounded by friends, family and large security men), and she looked well and happy. As for Elliott's set, he and Chris sang "Savin' Me" as a duet, a big crowd-pleaser of course. Luther Vandross' "Never Too Much" was well sung (but didn't have the same electricity as the other songs), then Moody's Mood and Elvis Presley's "Trouble." His voice was top-notch. The best thing, though, was how happy Elliott seemed to be home. He came back with the rest of the guys (minus Taylor) for a low-key, harmonized "Patience," and then the whole group for "We Are the Champions" and "Living in America." And he wore the R-Braves jersey during the encore. Everything he did sparked cheers and screams. Quite a homecoming. Fashionistas are no doubt aware of the re-emergence of the '80s in today's clothes. We were discussing this very trend at work the other day -- specifically leggings. This is a controversial topic: Who should wear leggings, and with what layers? Leggings are fine under knee-length dresses or skirts, we think, but not under a shirt. Some of us think a longer tunic top, belted at the hips if you are truly fashionable, is OK with leggings -- but only if you have really good legs. Miniskirts are fine, again if you have good legs. But some people with thick calves should stay away from leggings entirely. Horizontal striped leggings seem like a bad idea to me. Robin Givhan of the Washington Post is worried about the "democratization" of leggings. I'm disturbed by stirrup pants. Those of us who were around for the trend the first time remember how some folks paired crop tops with leggings. Gross, gross, gross. I bought a pair of leggings the other day, but I plan to be conservative wearing them (after all, this is Richmond). I'll stick with knee-length skirts, or maybe even another '80s trend: bubble skirts. Yeah. Now where did I put my jelly shoes? Does this bunny belong to you? "Flopsy" was unearthed from Harry Kollatz's office during our preparations for the Move Down the Hall. Since Harry has no idea where this dingy pink bunny came from, and since we think this may be someone's beloved, missing childhood toy, we're appealing to our readers for help. 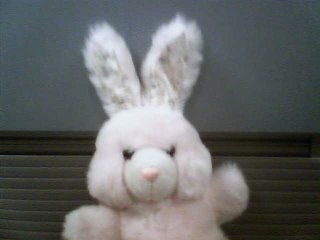 Tell us if you remember having this bunny as a child (and it may have been a while back -- Kollatz has been with the magazine since the Ice Age, oops, early '90s). We'll need proof, by the way. A bunny birth certificate, a store receipt, a picture of you and the rabbit... all are acceptable. Please save Flopsy. I'd like to wish these local bloggers luck in the upcoming "Weekend Without Echoes," a plan to include only original content on their blogs on July 21-23. As debate rages (even among bloggers) whether they are journalists or not, this is an admirable and interesting project -- proving that bloggers are more than just link monkeys. Of course, for their sake, I hope nothing really linkworthy happens over the weekend (presidential Segway mishap, Suri Cruise photo). Although I won't be able to participate, given our magazine's impending move, I support you guys. But I have a good reason. Can someone please, please, please start a larger-sized club in Richmond that will draw major acts? I keep noticing the same thing: A band I like has a date at the 9:30 Club in D.C., then skips to the Norva in Norfolk and then possibly to Charlottesville Pavilion. Or some variation thereof. Not that I mind driving an hour or two to see a band, but after a while, it gets old. To back my point: Ryan Adams, X and Henry Rollins, even Ryan Cabrera. Not that we're lobbying for him to come to Richmond. But it's annoying that there's not even a proper venue for these folks if they wanted to play here. We have room for big concerts (like the American Idols at the Coliseum), and Innsbrook gets some famous (if not always at peak-of-freshness) singers and bands. But that's just in the summer time. Smaller clubs give local bands a break. But there's definitely a gap. What Richmond needs is the Flood Zone. And to take a page from the Norva, make it non-smoking. Just for me. Please? Nope, I have no shame. I don't mind borrowing a Billy Joel title when need arises. * Vegan cookbook, with a picture of a green bull's head on the cover. * A dancing, singing gopher -- just like the one in "Caddyshack"
This is a time for exciting changes -- new office, plus a new look to the magazine with our August issue. Makes me want to dance -- although probably not with the gopher. We here at Richmond magazine are Your Reality TV Headquarters. So, in case you have a thing for Howie Mandel and models with suitcases, check out the local casting call for "Deal or No Deal." It's at Willow Lawn on July 21. Up until recently, the name "Felix" summoned black cats and fastidious bachelors. But now it's become an instrument for mudslinging in Va. political circles. You know what I'm talking about: "George Felix Allen Jr." The Senate race between Allen and Democrat Jim Webb is already getting ugly, and it's only July. But it's fighting words when a man drags out his opponent's, well, eccentric middle name. And the thing is, the "Jr." part isn't even right. But let's explore some possible reasons why Webb's camp decided to play the Felix card. * It's a French name. Yeah, there is still some animosity against the French in certain circles. * The Jr. part, however incorrect, reminds people that his dad was the Redskins football coach, and therefore a son of privilege. Webb's aide sure did manage to make a splash with this remark, to the extent that Dems from all over are now calling Allen by his full name. From the blogosphere: Felix, Felix and more Felix. But no Felix here. Of course, my question is, what's Webb's middle name? The best I could find online was "James H. Webb." Herbert? Hector? Harold? Knowing Virginia politics, we'll find out before the election's over. Did anyone else notice the Doody Calls story on the front page of the T-D this morning? Yeah, it's about people scooping dog doo for money. The featured company is out of Fluvanna County, but numerous other media outlets have picked up this particular story. Guess the T-D got scooped. Goochland resident Ben Wallace is apparently leaving the Detroit Pistons for the Chicago Bulls, according to news reports over the holiday weekend. It's not official yet, as free agents are not allowed to sign until July 12, but the deal is for four years and $60 million, ESPN says. (The Pistons came up short with $49.6 million, news reports say.) Nazr Mohammed has reached an agreement with the Pistons to fill Wallace's center position, the AP adds. The 31-year-old four-time NBA defensive player of the year surprised a few folks with the move to the Bulls. Good luck to the VUU graduate. Oh, and because I just can't resist, here's a link to more bull, er, cow news. This one's out of Charlottesville, but it has universal appeal. Let's all give a prayer of thanks that we live in the big city.